Be afraid! Be very afraid it’s time for FearPong! 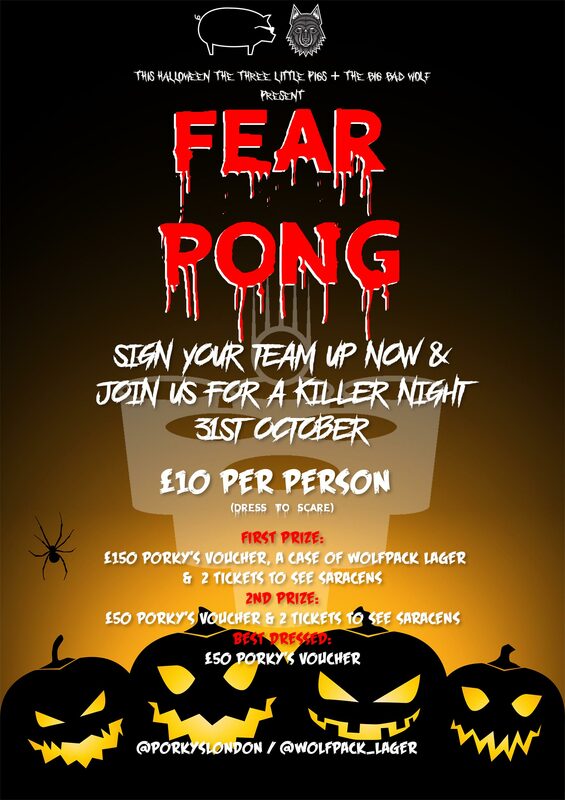 Are you brave enough to join us for the inaugural Halloween BeerPong tournament at Porky’s Bankside? Expect a loud and scary night! We are looking for 16 fearless & adventurous teams to compete in this bone chilling tournament. Each team will be made up of 2, so bring someone equally courageous and be the last team standing. All daredevils must be in full costume & willing to risk a fright cup with a spooky potion inside. T’s & C’s: 1. The ticket holder voluntarily assumes all risks and danger incidental to the event for which the ticket is issued, whether occurring prior, during or after the event. The ticket holder voluntarily agrees that the management, venue, event participants, DesignMyNight (WFL Media Ltd) and all of their respective agents, officers, directors, owners and employers are expressly released by the ticket holder from any claims arising from such causes. 8. Tickets are sold subject to the venue or promoter’s right to alter or vary the programme due to events or circumstances beyond its control without being obliged to refund monies or exchange tickets.